Tesla stock is down about 20% from its recent highs and bulls need to defend this name before the charts break down. Shares of Tesla (TSLA - Get Report) jumped on Tuesday, climbing more than 2.8% to $267.77 as the stock flirts with a dangerous breakdown. Investors haven't reacted in the way bulls would have hoped to the company's Model Y unveiling and efforts to expand Model 3 shipments around the world. Instead, the stock has been pummeled, falling from roughly $320 at the end of February to $260 on Monday. Tesla stock isn't immune to volatility and so this near-20% breakdown isn't all that surprising. Still it's important for bulls to step in and defend Tesla stock to keep it from further deteriorating. On Monday, Tesla stock hit a five-month low as RBC analysts published a punishing downgrade. However, shares bounced off the ~$255 level and closed up near $260. Where it bounced from is not surprising either, given that buyers have stepped in below $260 multiple times over the past 12 months. Further, channel support was there to help buoy Tesla stock. The question is now whether the stock can get out of this nasty downtrend. The 20-day and 50-day moving averages are acting as resistance. Further, the stock continues to make a series of lower highs and lower lows, a bearish technical development (purple arrows). If the stock can't get out of this downtrend, it's going to force a breakdown in Tesla stock. Let's look at a longer-term chart below. 3.5-year weekly chart of Tesla stock. It's quite clear on the long-term chart that Tesla stock is locked in a downward channel (blue lines). However, it's also clear where support is and how significant this $250 to $260 range has been over the past three-and-a-half years. The 200-week moving average has been a notable line of defense as well. However, it must be noted that over the past several years, Tesla stock tends to fail at this level, only to recapture it in the ensuing weeks. In this regard, the 225-week moving average actually acts as a better measure for moving-average support. However, I felt that using the 200-week moving would be more advantageous, the reason being that Tesla stock needs to recapture this level to keep it alive as a support zone. 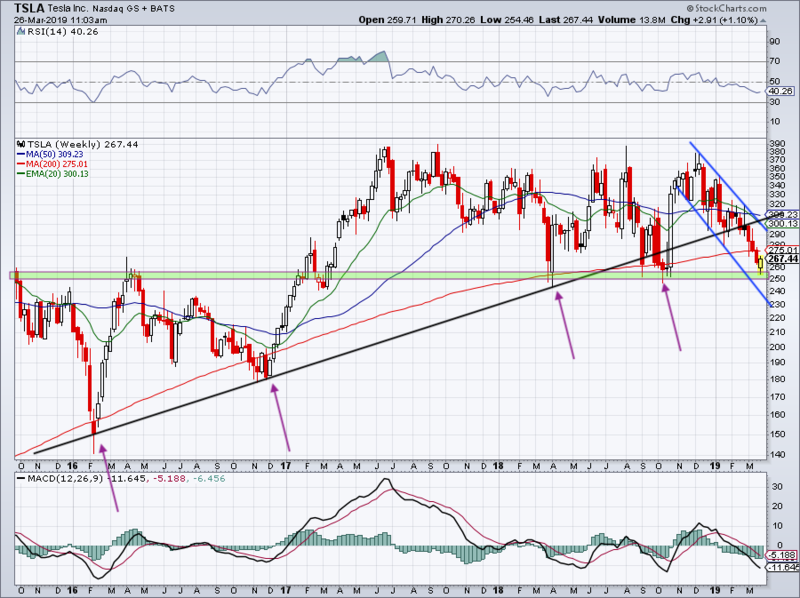 Should Tesla fail to rally back above $275 and close above it on a weekly basis, there should be cause for concern. If that's the case, it puts the recent low of $255 back on the table. Below that and the 52-week low of $244 is on the table. If that fails to buoy Tesla stock, shares could be bound for even more downside. 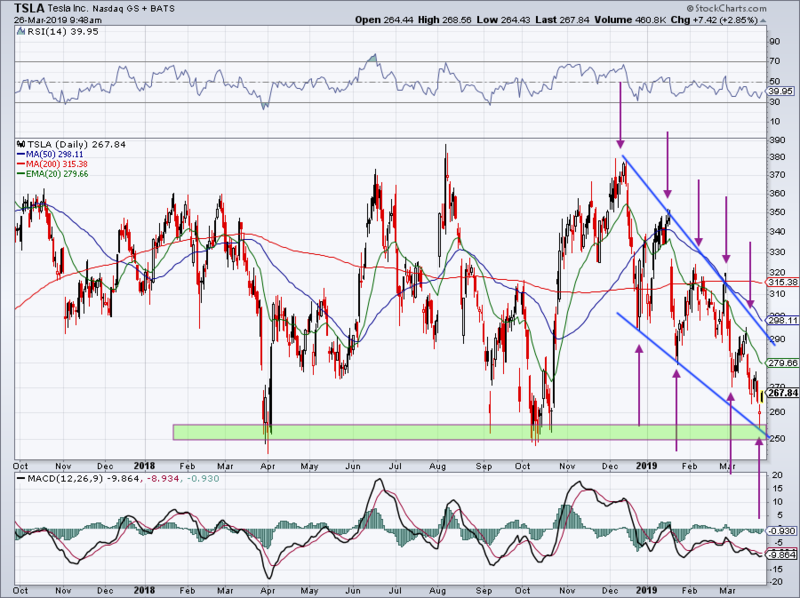 Over the 200-day, though, and Tesla stock will have to contend with its various downtrend levels from the first chart. But at least support will have held, and that's step No. 1 for the bulls.